Roofing professionals: architects, consultants, specifiers and contractors have all seen the ubiquitous UL logo on product literature, approvals, roll goods, membranes, accessories and coating products. While the UL logo provides some reassurance regarding fire safety of roofing materials, there is often some ambiguity about what REALLY is listed on the UL website. UL tests SYSTEMS, not individual roofing components. The presence of the UL logo merely shows that a product, e.g. 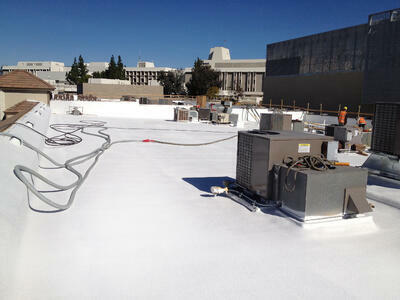 rolled roofing material, membrane, or coating is part of a tested system that meets the UL criteria. This means it is imperative that the specifier, consultant, designer of record, or contractor must use all the components in that rated system. Merely incorporating some of the components or "cherry picking" components is not permitted and violates the intent of the UL listing. National Coatings Corporation has an extensive list of UL listings. These can be found in the UL website: click here. Existing Roof System: - Any EPDM, TPO, Hypalon, PVC, TPA, modified bitumen or CPE single ply membrane system, mechanically fastened or fully adhered, non-insulated or insulated. Surfacing: - "AcryShield", 1½ to 6 gal/sq. May be reinforced with fabric (3 oz/sq yd max). Note 1: Classification (A, B or C) and maximum 2-in incline for membrane manufacturer's insulated or non-insulated Roofing Systems (TGFU) Certification. The above all encompassing listing allows for the use of AcryShield roof maintenance coating while maintaining the original UL listing for the existing roofing assembly. In summary, when considering a reroofing or recoating project, be sure to understand the specifics of the full roofing assembly and specify the appropriate system that conforms to the building owner, and local code requirements. For more on our roofing systems, credentials and ratings, download our Free Product Brochure.